Corsa Grotesk is another jewel in Typedepot’s expanding and original type library. It’s inspired by the all time classic Avenir but offers a more modern approach to the “Linear Sans” and “Grotesque” designs. Corsa Grotesk is designed with geometric simplicity in mind with well balanced horizontal and vertical strokes. Generous proportions and x-height as well as the minimal contrast makes Corsa Grotesk great addition to the contemporary graphic designers toolkit. The type family comes 10 weights from Hairline to Black plus their, matching and absolutely fantastic true italics. 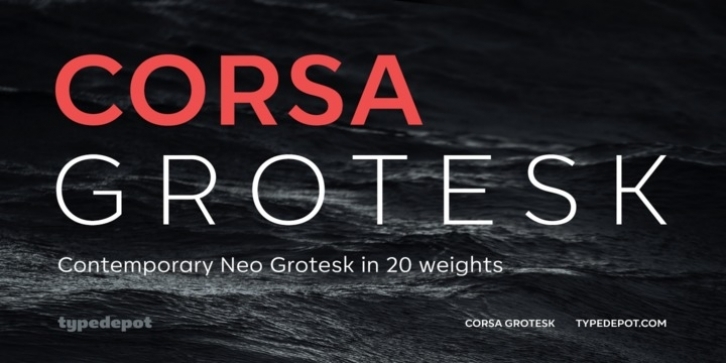 The wide range of weights makes Corsa Grotesk suitable for both texts and headlines. On top of that Corsa Grotesk supports Cyrillic with both Bulgarian and Russian localizations plus a wide range of OpenType features.